CDU artist in residence, Bambang Toko Witjaksono will provide the next School of Creative Arts and Humanities artists' forum on Tuesday 16 September from 12pm. 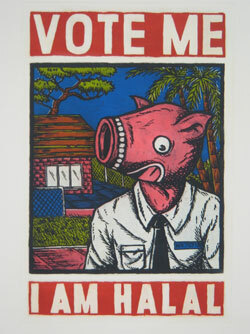 Bambang is an artist lecturer at ISI Yogyakarta, Indonesia, and is president of the Jogja Print Network. He is currently an artist in residence at CDU’s School of Creative Arts and Humanities funded by the Ford Foundation Jakarta. This forum takes place in lecture theatre Blue 1.1.01.